One of the marks of a good disc golf course is good signage. It’s nice to have a full course map at the beginning of the course, individual tee signs for each hole, and directional arrows where it may be difficult to find the next teepad. 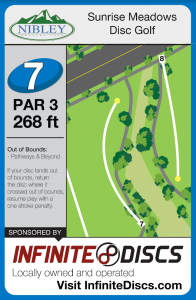 Depending on the course layout, it also may be necessary to include “mandatory” arrows to require disc golfers to throw through a desired lane. All Pin Locations (If there are multiple basket locations it’s also helpful to have a way to indicate which location the basket is in that day). Having a section of tee signs to be used for advertising is a great way to subsidize costs and help pay for a course. 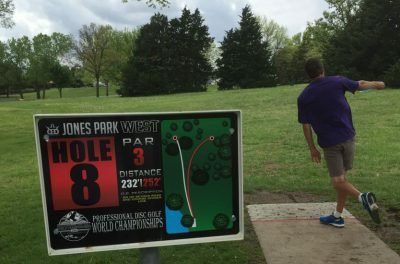 Many disc golf courses are able to fully fund installation costs by offering sponsorship advertisements to local businesses.